I’ve never been much of a cat person – or so I thought, until we had the two cats of a co-worker over last year. They were very cute and easy to be around. They didn’t destroy anything, used their cat litter properly, and provided a lot of cuddles and warmth. Ever since then, I’ve been more open to the idea of cats, and we’ve talked about it enough that it was clear we’d get cats one day. While the plan was to get two shelter cats eventually, we were swayed by a co-worker whose cat had kittens. I feel somewhat guilty about depriving a shelter cat of a new home and going for the cute little kittens, but I suppose the truth of the matter is that we wouldn’t have cats yet if it hadn’t been for the kittens. They were there, they needed to be adopted by a certain date, and we had to make our mind up. But be that as it may, if you want to get cats, you have to be prepared. I prepared by reading a book called Think Like A Cat by Pam Johnson-Bennett. She’s basically what Cesar Millan is to dogs, and the book is excellent. It’s got everything in it from how and what to feed them, how to make them use a scratch post rather than the couch, litter training, how to play with them, how to cat-proof your house, explanations on clicker training and whatnot. Tons of well-written information and certainly a good start for a cat n00b like me! Next was getting the house ready. Since they are kittens, we decided to start off by confining them to one room – the empty guest room. (I call it the music room, but I have since removed all the guitars, as I don’t want them scratched by energetic furry imps!) 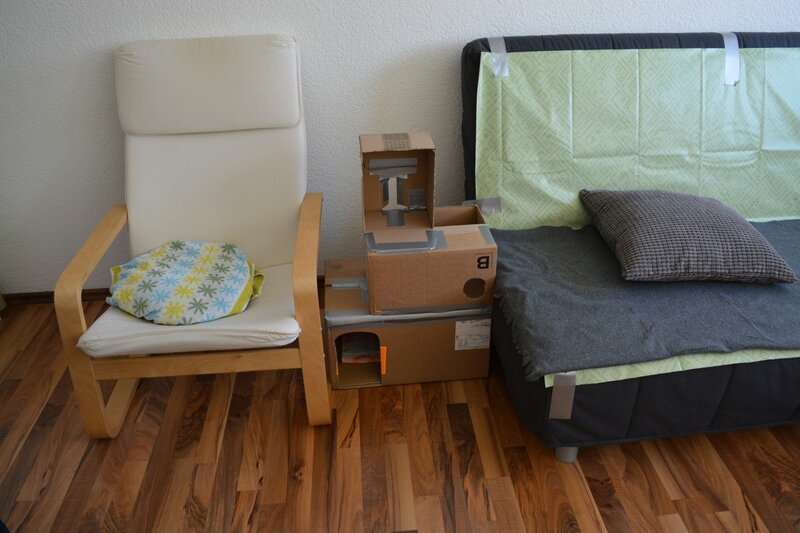 So we took the curtains down, removed anything breakable and covered the couch and Ikea chair with cheap blankets. Then we got a cat litter tray, a carrier, a toy on a string, tons of cat food and bowls to eat and drink out of. The kittens even got a little cardboard box house! It was very difficult to wait the few extra days till we got them! I’ll tell you more about the experience of taking them home in the next entry though.